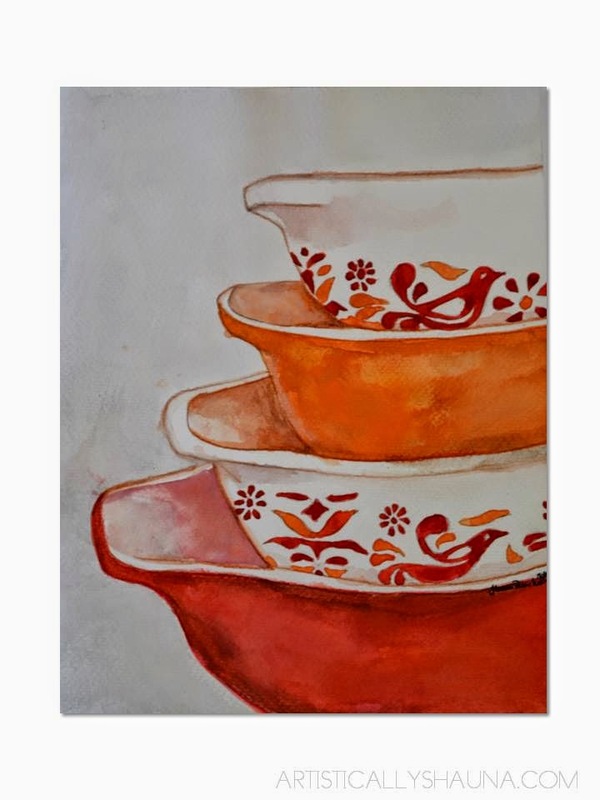 I am excited to share with you my watercolor painting I painted of vintage Pyrex. Oh, how I love vintage Pyrex and it was so much fun to paint this painting. I particularly chose this orange pattern since I painted this painting for my sister. 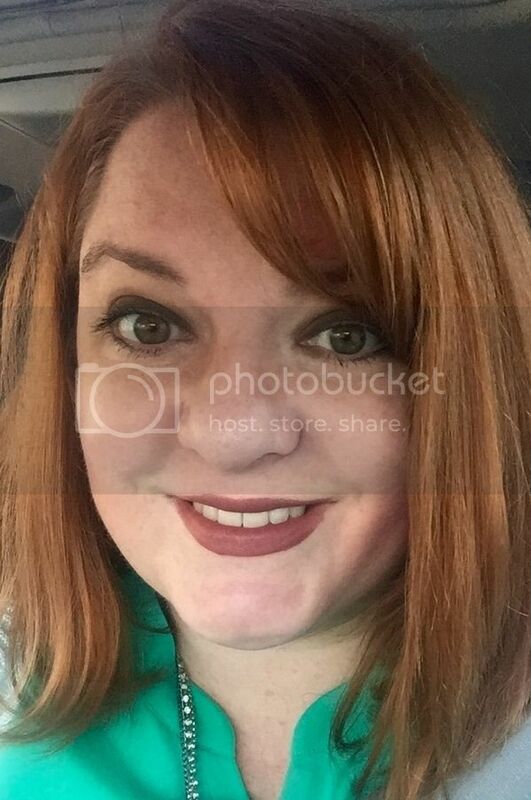 My sister went to Culinary School and is an amazing chef and she loves the color orange. Here is an up-close picture of the vintage Pyrex pattern I painted. This particular pattern I believe is called the "Friendship Pattern". You can see some real examples of this lovely vintage Pyrex for sale HERE on Etsy. Here is another up-close picture of the top nesting bowl. I really loved how this painting turned out in person and I hope that my sister loved it as well. I definitely want to paint a lot more vintage Pyrex. I absolutely adore all of the colors and patterns that they came in. Plus, I love all things vintage! I own one vintage Pyrex piece that belonged to my later grandmother. It is a large glass mixing bowl that is yellow on the outside and white on the inside. I need to take a picture of it for you. We use it all of the time. While looking for treasures in thrift shops I have been on the hunt forever to find another piece of vintage Pyrex. Up until now I have had no luck. Well, I am happy to say my luck finally changed. Look at the darling piece of vintage Pyrex I found above. Not only did this cute little serving dish contain one of my favorite patterns and all time favorite colors (or maybe it is a butter tray? ), but I scored this little beauty for only $1.00. Yes, one dollar. Can you believe it? It is in perfect condition. I know that this picture is hard to read but I wanted to take a picture of what the writing on the underside of the dish said. So, all of my Pyrex lovers, can you tell me what pattern this is and maybe more specifically what this darling dish was used for? I have more pictures of amazing vintage Pyrex collections in my "Vintage Loves" Pinterest Board HERE. I am also thrilled to be linking up to Paint Party Friday's Link Party. It has been a while since I have had a chance to participate. This "Retro Orange Pyrex Painting and Vintage Pyrex Teal Dish" post first appeared on my blog, Artistically Shauna, on May 22, 2014. Gorgeous painting I know that pattern well I think I had a few pieces in the 70's... I think my daughters mother in law has some too!Looks even better in your painting!! Love it! You should try garage sales...they usually have those kinds of hidden treasures! Your painting led me right back to the 70's when these first camo on the market. Beautiful painting and I'm sure your sister will love it. You are so talented! Your pyrex paintings look exactly like the real thing. Beautiful work. What a terrific gift for your sister! You did such a great job - and you totally nailed the colors! Wonderful work! Oh how I love orange pyrex, it reminds me of homecooked shepherds pie in the 1970's ( showing my age)You paint beautifully! I guess I am vintage too because I grew up with all that "vintage" Pyrex! Your painting is just lovely and captures the inspiration pieces perfectly.